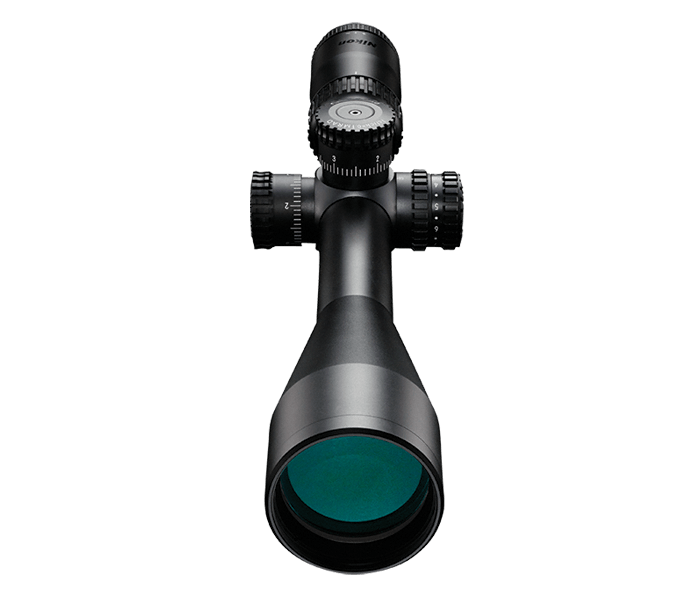 The 4-16x50SF is a dedicated precision riflescope that offers the precision, the features and the ruggedness serious shooters demand. For starters, it is built with an aircraft grade aluminum alloy 30mm main body tube. With a choice of X-MOA, Illuminated X-MOA or Illuminated X-MRAD reticle, the riflescope delivers 90 total MOA internal adjustment travel for the X-MOA reticle and 25 MRAD for X-MRAD reticles. Its turrets have ¼ MOA or .1 MRAD click graduations yielding 12 MOA / 5 MRAD per revolution depending on variant. All of the 4-16x50SF models have the reticle placed in the riflescope’s second focal plane, so all holdover corrections, ranging and other measurements using the indicated reticle subtensions should be done at 16x magnification. Specialized reticles and adjustment systems in BLACK X1000 are glass-etched MRAD or MOA tactical-style variants with illuminated option. Windage and elevation turret internal travel is enhanced for long-range dialing and crisp, click-stop movements operate with no backlash and are both precise and repeatable. The X-MRAD reticle presents the shooter with clean and visually simple, yet highly functional and advanced tools for estimating range, maintaining holdovers or dialing elevation come ups and compensating for wind. An advantage of using these tactical-style reticles is that it can be applied to virtually any shooting application regardless of caliber or ballistic performance, and can be further optimized for specific shooting situations utilizing Nikon’s Spot On Ballistic Match Technology. With a very capable four-time zoom optical system built with Nikon’s renowned lead- and arsenic-free glass, BLACK X1000 lenses are fully multicoated with anti-reflective compounds for consistently bright, sharp, high contrast sighting at all magnifications. Each of the riflescopes in this series features a turret-mounted side focus parallax adjustment to enable fine-tuning of the sight image without changing shooter’s position. Consistent eye relief keeps your brow safe, while the exposed turrets are engraved for maximum readability while offering smooth, repeatable adjustments.